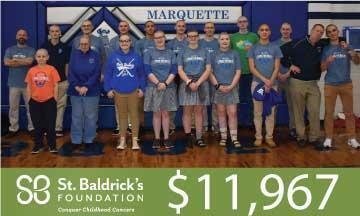 The 8th annual St. Baldrick's Foundation event brought together students, faculty, alumni, and members of our community to show MCHS's commitment to raising money to help find a cure for childhood cancer. It's not too late to donate. Thank you to all who participated: shavees, hairdressers, those who donated and Riverbender for broadcasting our event live. Our donation link will remain active for two more weeks. If you would like to donate, please click here. This is Triston's 10th year to participate in the St. Baldrick's event. Mr. Slaughter and Stephen discuss how fast he will be able to ready for school in the morning.